If you are of a certain age or a student of history and can remember Lyndon Johnson’s presidency. this movie should grab you, fascinate you and hold your attention. Johnson (magnificently played by Woody Harrelson) was a seven term United States senator from Texas who was for many years, majority leader of the U.S. Senate and was chosen by JFK to be his vice presidential candidate. He rode to victory with Kennedy in 1960. Rob Reiner, who directed this movie with the use of very realistic flashbacks, builds up the tension leading to those fateful days in Dallas in 1963 when Johnson assumed the presidency. Much to the surprise of his former southern Democratic colleagues in the Senate, Johnson did not support their views on segregation and discrimination. 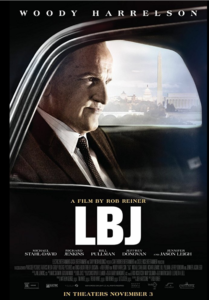 This movie written by Joey Hartstone deals mainly with how LBJ pushed through JFK’s cutting-edge Civil Rights Legislation. Harrelson is fantastic in capturing the essence of LBJ, his mannerisms, facial expressions, and speech inflections. Along with the script by Joey Hartstone and direction by Rob Reiner, in our opinion, this is one of the best pictures of the year. There also are some very fine performances by Jennifer Jason Leigh as Lady Bird, Richard Jenkins as Senator Richard Russell and Michael Stahl-David who plays Bobby Kennedy.